Alright. So, like all good stories, this one starts in Japan. … wait… that’s not how all good stories start??? Well, it’s how THIS good story starts. So about a year ago at the time of this writing, Ryan and I were traveling through Japan. And if you know art supplies, and brush pens specifically, you know that Japan is THEEEE place to find the very best quality supplies. 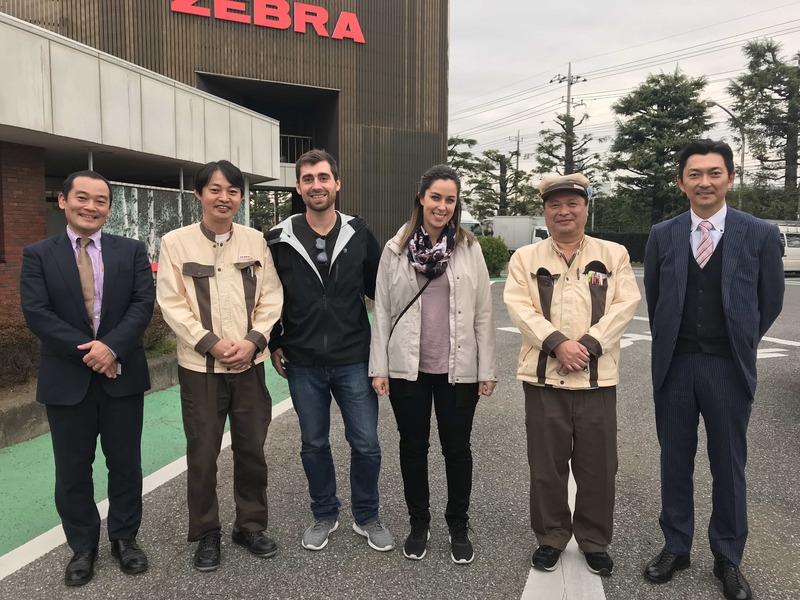 And while we were there, I was (amazingly) invited by one of the largest pen companies in the world, Zebra, to come and tour their factory. Whaaaaaa?! How is this my life?! Long story short, Ryan and I got picked up by a lovely man named Mr. Honda, who brought us a couple hours outside of Tokyo to visit the factory. And LEMME TELL YOU- it was like being inside an episode of How It’s Made. It was beyond cool. And omg, do the Japanese ever have this way of making you feel welcome and important. They are the kindest people. BUT, as we neared the end of the tour, I realized… ummmm… we haven’t seen any brush pens yet. Only felt tip pens, and ballpoint pens, and nibs. Where are my beloved brush pens? So I spoke up, and asked Mr. Honda. “Mr. Honda, do you have any of the pens like THIS?” (And I whip out this picture on my phone). And I kid you not, he looks at the picture, and walks out of the room. I’m like, omigod, I said something offensive. And juuuuust when I’m turning to Ryan to panic, Mr. Honda walks back in with a BAG full of brush pens for me. I’m talkin’ like… 100 brush pens. AND THAT’S NOT EVEN THE EXCITING PART. I reach into the bag, and yes, it included the pens in the photo above, which I indeed knew and loved. But what I wasn’t expecting were the ones I had never seen before. And I genuinely think I scared Mr. Honda with my reaction. You see, Zebra had been holding out on us, you guys. 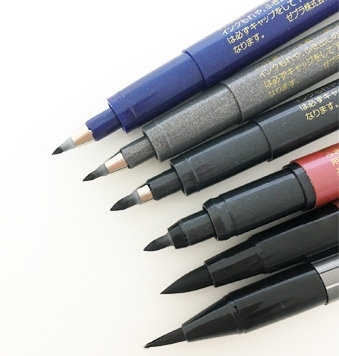 Until that day, I (along with literally everyone else I knew in North America) was under the impression that there was only one option for coloured, small-tipped brush pens… the Pentel Fude. And listen- the Pentel Fudes are good…. but if you’re reading this, I know you. You’re like me. You don’t just want GOOD. You want THE BEST. And you want ALLLLL THE PENS. 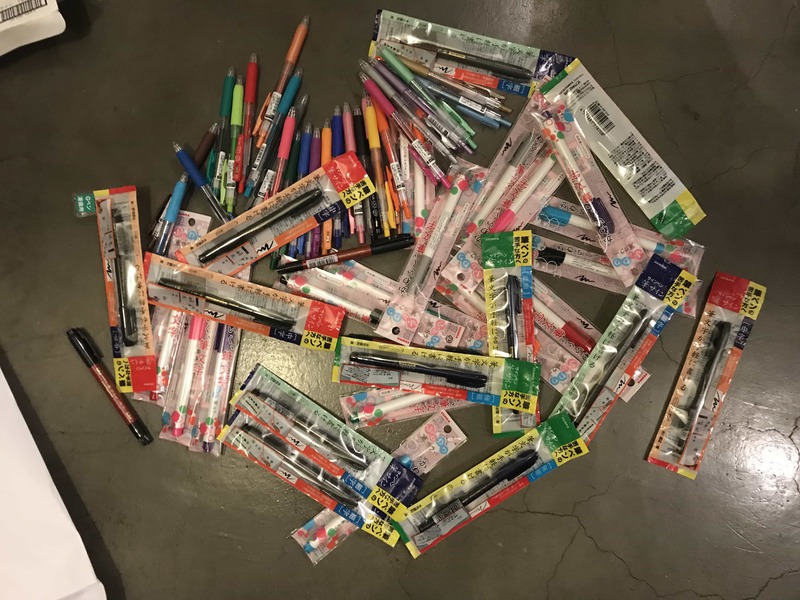 So when I reached into the fun-bag Mr. Honda handed me, and pulled out a fistful of small-tipped, beaaaaauuuuuuutiful coloured brush pens, I just about lost it. And he was sorta like… Oh? The Funwari pens? Do you uhhhh…. want some more? As if it were NOOOOO big deal. Silly question, Mr. Honda. OF COURSE I WANT MORE. AND I WANT TO SHARE THEM WITH EVERY SINGLE ONE OF MY PEN-FRIENDS! A little bit of the contents of that magical bag of brush pens from Zebra. After that magical trip to the Zebra factory, and after I returned home to Canada a few months later, you can bet I was in touch with Zebra all about these pens. They finally started being stocked by some of the bigger pen companies in North America, and a couple people were starting to talk about them on Instagram. But the wheels were in motion for me. 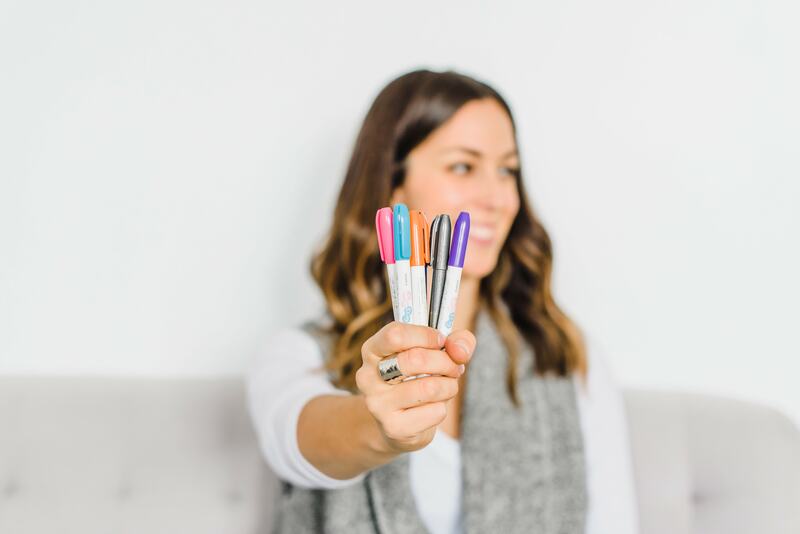 I loved these pens SO much that I somehow needed to be involved with them. So I partnered up with Zebra Canada. And they let me come up with my DREEEEEAM pack of pens- a combo of a couple of colour options AND also my go-to black pens. A combo pack that would only be available through me! And that, my friends, is how The Happy Ever Crafter Favourites pack came to be. And I am BEYOND excited to tell you that these packs are officially available to purchase! You can read all about them below. Okay, cool story. But what’s actually included in the set? The set is a combination of different types of pen. Inside, you have 4 Zebra Funwari pens, and 2 black Zebra brush pens in different tip sizes. The Funwari pens are considered an “extra fine” small-tipped brush pen, and so is one of the black pens. The other black pen in the set is a tiny bit bigger (though still considered a “small-tipped” pen) and it’s a little softer, so it can give you thicker downstrokes. Does anything else come with the set? Hehehe, yup! How’d you know?! 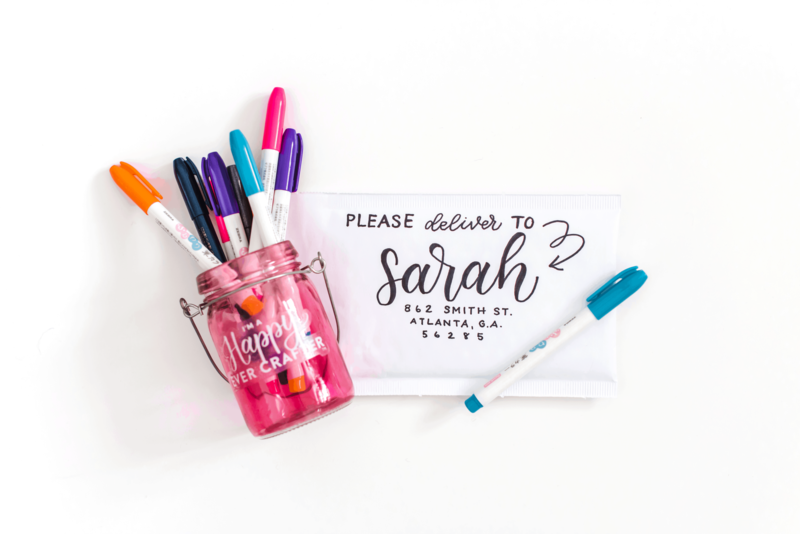 Aside from the pens themselves, you’ll also receive an exclusive “I’m A Happy Ever Crafter” sticker! And there’s one other goodie inside, but I can’t spoil the surprise for you!! The 6-pack and other included goodies costs $36 CAD- and this INCLUDES shipping & handling. (For my American friends, that equals roughly $27 USD, all-in!) If you’re outside of Canada and the U.S., an extra shipping charge will apply. Not this set, nope! 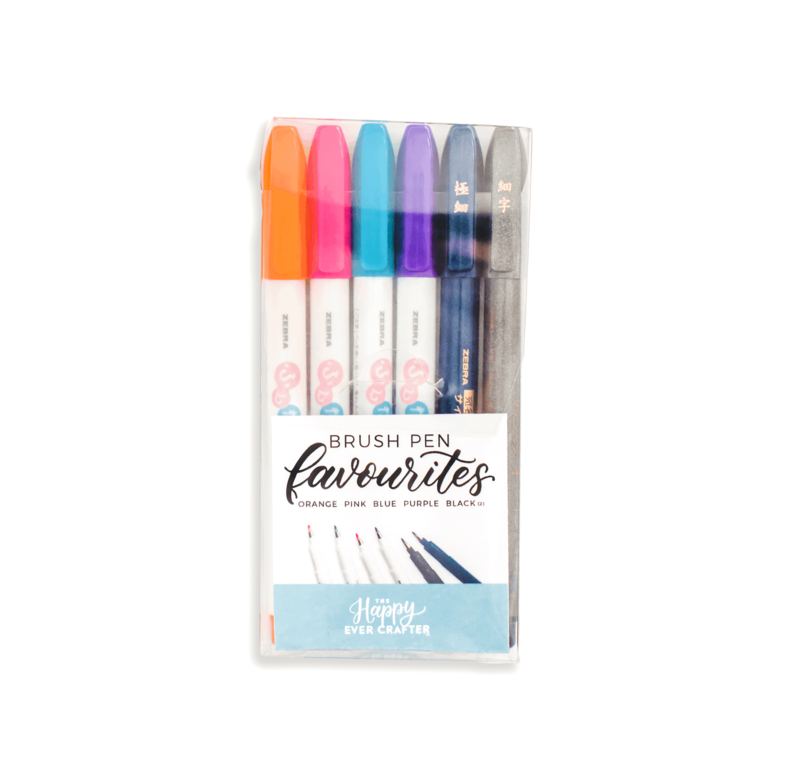 The Happy Ever Crafter Brush Pen Favourites set is only available here until supplies last. 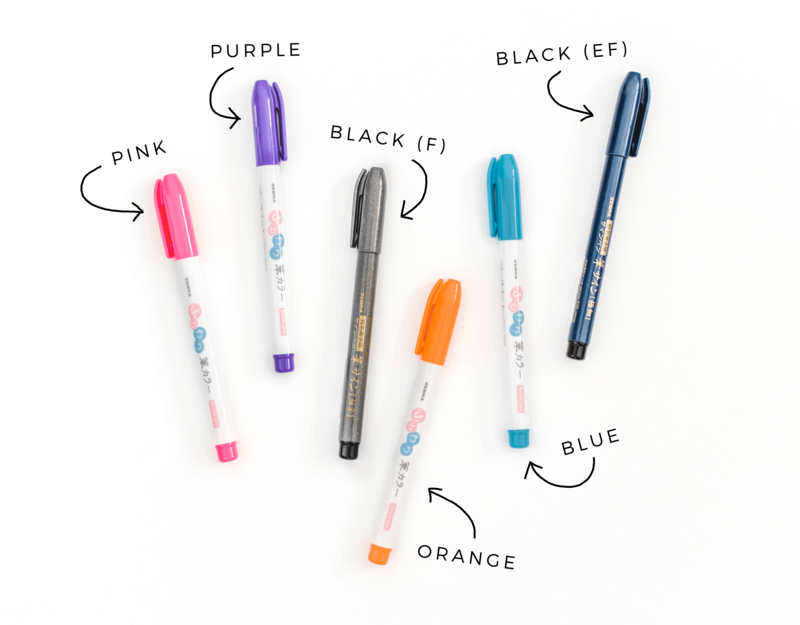 You could buy each of these pens separately from some other retailers (like Zebra directly! 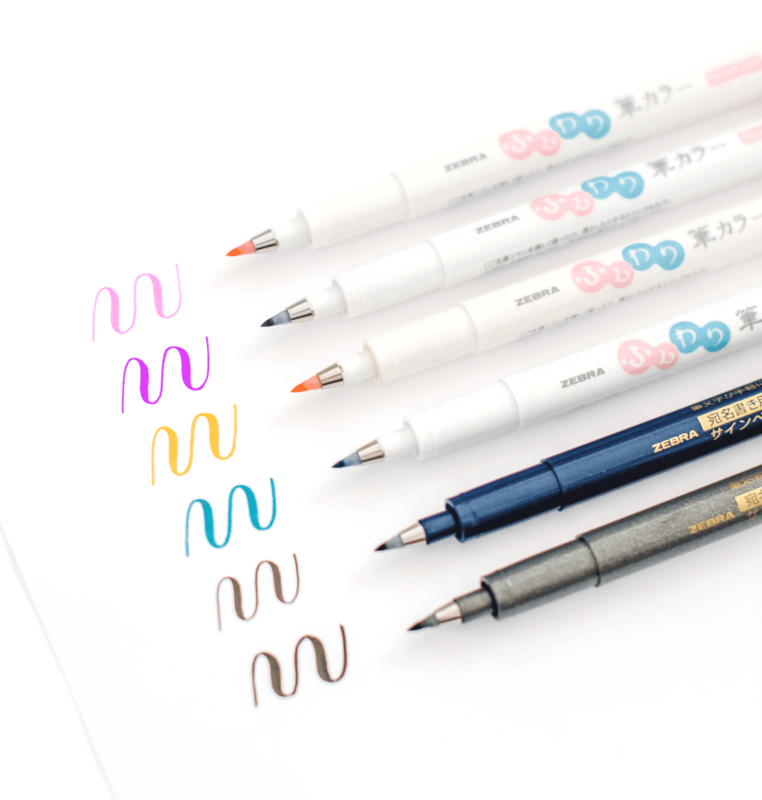 ), but this 6-pack specifically, with a mix of coloured pens and different sized black pens, is ONLY available here, from me! You won’t find this combo pack anywhere else. Are these going to be available forever? No! This set is a limited edition and I only have a limited number of them to ship out to you! If you’re interested, you’ll have to act quickly! 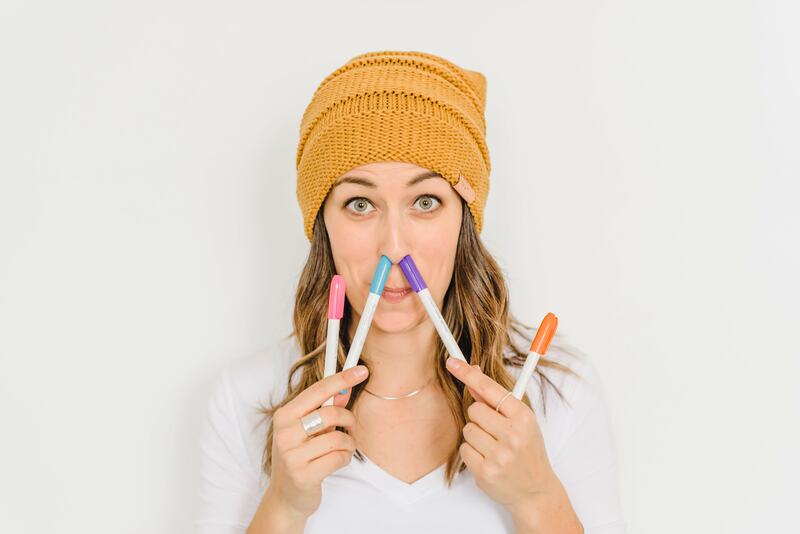 Most importantly, will these pens fit up my nose? Ready to check them out?? You can find more info, photos and the order page here! Nooooo they’re already sold out! Regardless, congratulations!! This is so exciting! The pens look fabulous. Becca are these pens required for our books somewhere? or are they just fun pens. Just for fun, but you can certainly use them on your workbooks, too! Ordered me a set. Can’t wait to check them out! Congrats Becca and how fun it must have been to pick out the set! !